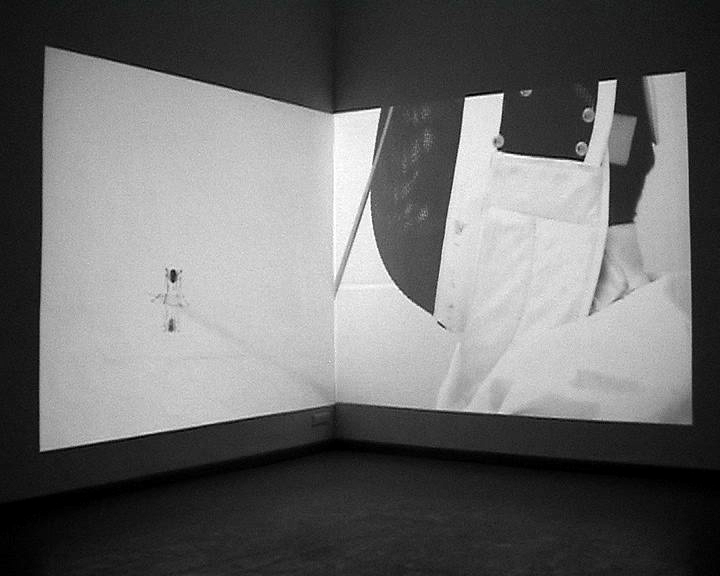 A fencer is trying to fight a mosquito, in a complete empty, white room, without windows or doors. A minimal, highly precise Video. One Screen shows the mosquito, the other shows the fencer and the action/interaction between them. Waiting, Watching each other, thinking, fighting. The soundtrack seems to pending in abeyance, highly interacting with the pictures in the installation. 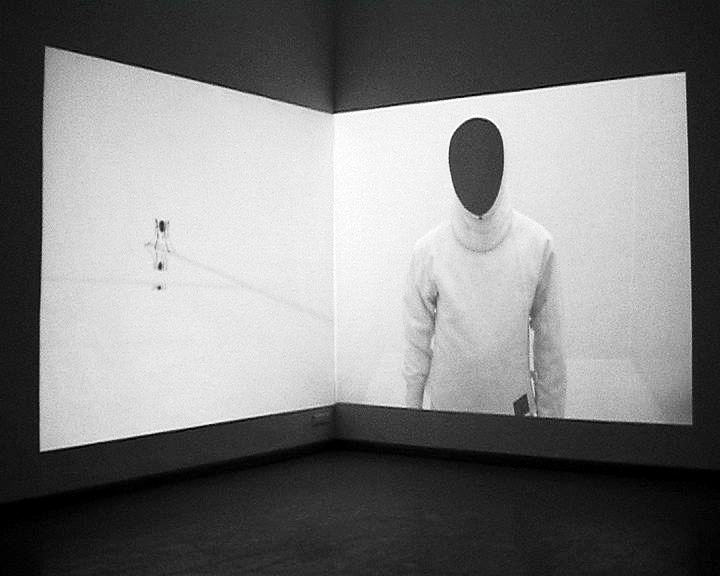 A high tone, like from a flying mosquito, fast trigger notes and bass frequencies, for the fencer, silent breaks after action and suspending tone float in between... the installation remains on science fiction movies, the acting room is not defined, also open for projections that the visitors can connect with. The visitors can read the metaphor of this video also as a fight like David against Goliath. It is a kind of absurd metaphor, and is also readable as a commentary for situations, everybody knows. No one win - a never-ending story. The music of the installation is made with digital-analog synths, real samples, computer interfaces for generating sounds, granular synthesis, with mathematical precision... full effects of the sonic installation can be only reach, when the presentation take place in a closed room, with blank walls, because the sonic part of the installation is a 5.1 sound who will echoed back. 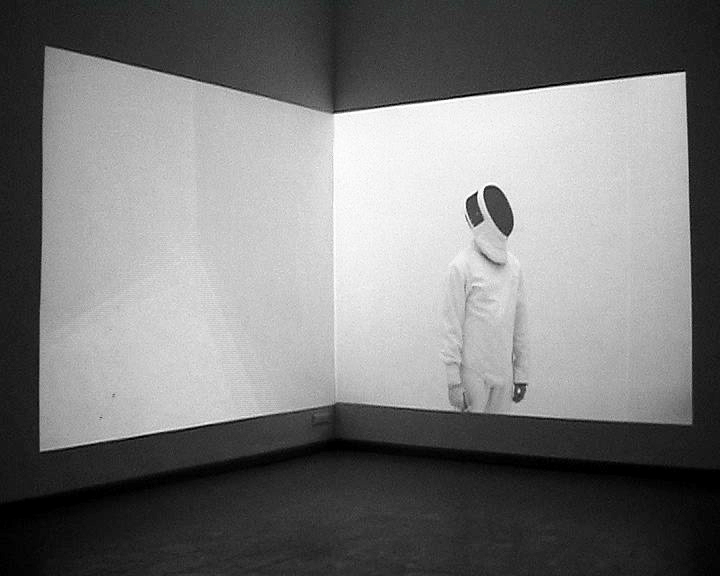 This work can be described as a cross platform between sonic installation and video work. Parts, the sonic and the video part working together in a highly precise matter.